This body of artwork was an outcome of a Vice-Chancellor's College Visiting Artist Fellowship in the ANU College of Asia and the Pacific. The Fellowship has enabled me to work collaboratively within a multi institutional project initiated by Adjunct Associate Professor Bronwen Douglas. This project investigates the varied collections assembled during the expedition commanded by Joseph Antoine Bruni d'Entrecasteaux to Tasmania, the Western Pacific Islands and Indonesia in 1791-4. The range of artefacts amassed include written journals, maps, natural history specimens, drawings, vocabulary lists and the cultural artefacts of peoples encountered. My primary role in this project was to creatively respond to the visual record generated by the neo-classical artist, Jean Piron, who accompanied the voyage. A selection of Piron's drawings were transformed into engravings and published in an Atlas by the naturalist Jacques-Julien Houtou de La Billardière as part of his Relation du Voyage à la recherche de La Pérouse (1800). Many of the engraved Atlas images are portraits of Oceanic peoples. These were often the direct outcome of a negotiation between artist and sitter. A small number of plates depict specific, physical encounters. 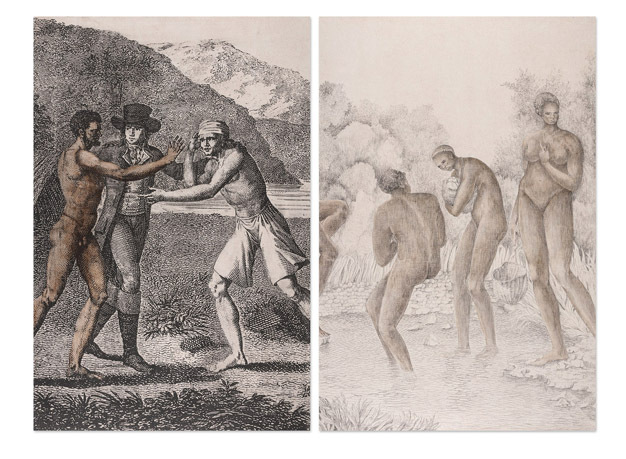 Critically examining how these encounters were visually recorded, in conjunction with reading Labillardière's journal account, enables a rich exploration of these events. My paintings and objects quote and re-present selected aspects of the represented encounters. This enables an imaginative elaboration of the nature of these events. Themes alluded to in my works include the role of the body as a site of exchange, display of power and channel of communication; the fact that encounter was a meeting and melding of cultural perceptions; and the driving role of material exchange in initiating many encounters.